When a mint copy of the final album by “Valerian” – England’s great lost rock band of the 1960s – surfaces in a charity shop, all hell breaks loose. Finding this record triggers a chain of events culminating in our hero learning the true fate of the singer Valerian, who died under equivocal circumstances just after – or was it just before? – the abduction of her two-year-old son. 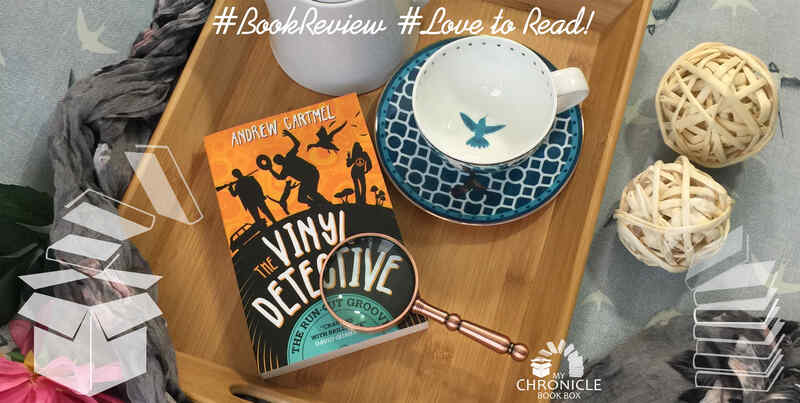 This is the sequel to Written in Dead Wax and is another fast, fun read from Andrew Cartmel featuring The Vinyl Detective. This time he is working side by side with his girlfriend, the irrepressible Nevada Warren and we get a glimpse into the music scene of the 1960’s. It is written from The Vinyl Detective’s point of view which allows Cartmel to keep us frustratingly in the dark about our protagonist’s name. I love this quirk, although I can’t fathom why since it frustrates me so! For the purposes of this review, I shall refer to him as Chef a nickname he picked up in book one but which doesn’t appear in book two. In this second book Chef reluctantly takes on a case which right from the start, clearly involves more than simply finding a vinyl. He is more or less manipulated into it by the multi-talented Nevada and before long it becomes a dangerous murder mystery and missing person case. This is just what he feared and people are soon trying to kill him, Nevada and their friends. Luckily, the would-be assassins are quite inept and the detectives survive long enough to get to the bottom of things. Whether this is to the satisfaction of his clients is amusingly questionable. While we don’t learn much more about the key figures than we knew from the last book in terms of backstory, we get to know them better through their interactions with each other. It was nice to see Chef and Nevada building a good foundation together after their tumultuous relationship in the first book. I am pleased to report that Tinkler, Clean Head, the cats and Stinky from the last book all feature prominently in this sequel. Although the ending seemed a bit abrupt overall it was a quirky, fun book and I am looking forward to the third book, Victory Disc, already scheduled for release in May 2018.